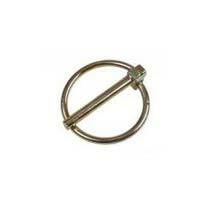 We are one of the leading Manufacturers, Exporters and Suppliers of the wide array of Linch Pins. We are flexible in offering the perfectly designed, accurately manufactured Linch Pins that are available in all sizes (zinc dichromate plated). We have state of the art manufacturing unit for the fast yet precise production of Linch Pins that the customers can avail at market-leading prices.